We decided to take the risk and stay. Our interpreter went to the local fish market and asked around for anyone willing to meet with us. One fisherman said he would, but only late at night and not inside our hotel which we knew was bugged. At 10 pm, I went with our Russian-speaking expedition leader to the fisherman’s truck in the parking lot. We were uncertain and a bit scared (what if he was another agent of the government?). Our colleagues were close by keeping watch over us. We climbed in, and as soon as we did, the fear passed. The grandfatherly fisherman said he was taking a big risk in meeting with us, but it would be worth it if the truth got out about the massive overfishing beyond quotas, especially due to poachers. He had a rough white beard and hardened, tanned skin from decades of fishing. He agreed to take us to the tonya, or official fishing grounds, early the next morning to see how few fish were left. That day seine fishing on the Volga River was one of the most remarkable of my career in conservation. We found fishermen who cared and were worried to see that all they were catching were young sturgeon that likely had never gotten a chance to spawn. The species was being fished to death for their eggs. What future would they have as fishermen if something wasn’t done to catch the poachers and better manage the fishing grounds. 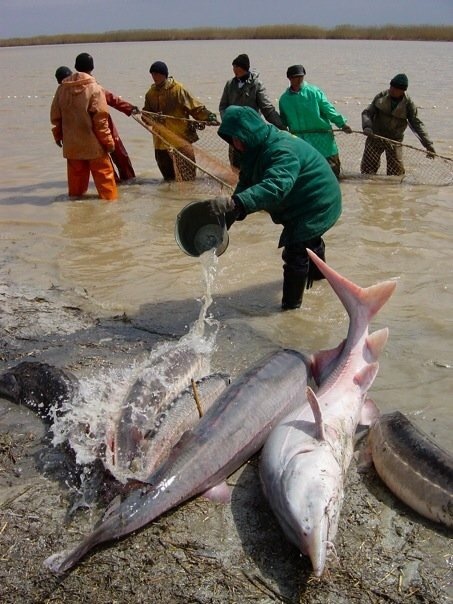 The captain told us, on video, that the solution was a 10 year fishing moratorium on beluga sturgeon. Yes, a fisherman who could fetch enough money to live well for a year from one beluga said, we must stop. We brought that message home to American media. At that time, the US market for Caspian beluga caviar ranged from 60-80% of international consumer demand. The truth got out, many restaurants and purveyors stopped selling beluga caviar, and a few years later we achieved our goal when the US banned imports of Caspian beluga caviar. On the other side of maximum fear is freedom and truth. What area of your life are you giving up on? What could happen if you didn’t? The only purpose of fear is to hold us back. Fear doesn’t protect us or keep us safe, it endangers us. In taking risks, all of our dreams and our potential contributions to building a better world are not only possible but assured. One way or another, you will achieve it if you decide to.